Explore the dreamiest of footwear with our slippers collection for men and women. 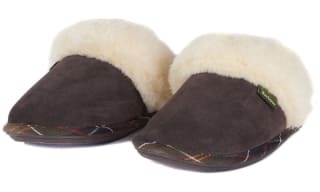 Everybody loves a wonderful pair of slippers that are perfect for roaming around the house in on relaxing days and comfy nights - especially if they're insulating and cosy. 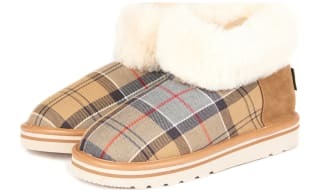 Whether you want to invest in your own slipper selection or require a special gift for a loved one, we're sure you'll find the perfect pair in our extensive range from some of your favourite brands such as Barbour - who's Monty House Classic Slippers have become a household favourite thanks to their gorgeous faux fur lining and classic tartan outer. Executed in the highest quality and crafted from the finest materials, our slippers radiate a pure luxury and indulgence - making them the ideal counterpart to your night-time routine. Whatever your personal style, explore our slippers compilation that includes signature patterns and construction from exclusive brands. Here you will find our full range of luxury slippers for men and women, featuring brands such as Barbour, Joules and Seasalt there is something here for everyone! Whether you favourite style is a moccasin or a mule slipper you will find the slipper which is perfect for those lazy days and cosy evenings. Fur lined slippers are perfect for adding a touch of warmth to those colder evenings. Here you will always find the classic Barbour Monty House slippers which are a favourite among our male customers year after year! Always a number one around Christmas time! Nothing says cosy like a faux fur lined slipper! Perfect for cosying up in on those lazy days or those cold evening spent by the fire! Here you will find Classic Barbour styles sneaking in, updated with a soft and cosy fur lining! For the ladies Joules are always bring out a fun and feminine cosy slipper you are sure to love. 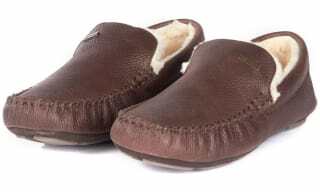 Discover classic moccasin slippers right here, stylish yet comfortable we are sure you won’t want to take them off! From fur lined moccasins to more classic styles there is something here for everyone. Season after season you will find this section packed out with classic moccasin styles from Barbour, we just know you will love them! P.S remember to take them off before you leave the house, there so comfortable it can be easy to forget! If you are looking for a convenience slip on style then a mule style slipper is perfect for you! Here we have the best styles from Barbour, Joules and more. We are sure you will love the convenient pop on, pop off style of these slippers. This simple yet stylish design is perfect for both lazy days and cosy evenings. Whether you are looking for a classic Barbour Tartan or a faux fur lining there is something here for everyone! 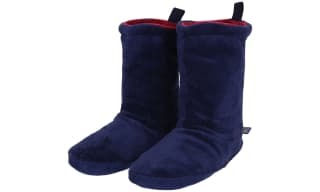 The slipper boots are perfect for those lazy days at home! Slide them on in the morning and leave them on all day if you wish! They are the perfect companion for time spent cuddled up by the fire and we assure you they are all as cosy as they look. 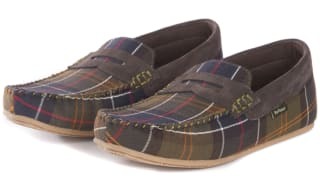 Featuring slippers from Barbour, Joules and more you will find a style to suit you. Why not head over to our nightwear section find more welcome additions to your cosy day attire. Nothing says cosy like a pair of super soft slipper socks, they make the perfect companion for those lazy evenings! Here you will find some of our favourite slipper socks from brands such as Joules. These slipper socks make the perfect gift for a loved one!